With all the commotion of the events in the last 24 hours, it is easy to forget tomorrow is Primary Election Day here in Marion County. So, for the moment, we’ll turn our attention to local politics. We are interested in two races. First, we are obviously interested in seeing the outcome of the Democratic Primary for Mayor. Kennedy did do some radio ads but has been otherwise fairly quiet and did not even have yard signs until a few days ago. In short, her campaign has not exactly put forth an impressive effort in a primary we believe they should have taken more seriously. First, she is running against the last name Carson and that should never be taken lightly. Second, simply winning the primary may not be enough. Many in the Indianapolis political circles believe that Kennedy needs to get more than 85% of the vote to really show she has the support of the Democratic Party faithful particularly with the reported rifts within the Marion County Democrats. We don’t think she’ll get it. The second race we are interested in is the At Large Council race on the Republican side. For those who may not know, the Republicans have slated four candidates and a fifth is running against the slate. 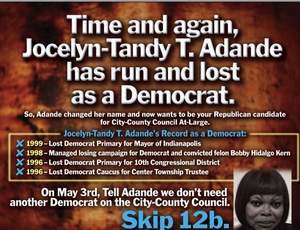 Jocelyn Adande Tandy, a former Democrat, is running and actually changed her name so she could get better ballot placement by switching it to Jocelyn Tandy Adande. She also is a former Democrat who has run for Mayor and several other offices as a Democrat. The Marion County Republicans sent a mailer out highlighting her Democrat history. At this stage, it seems everyone in both Parties think she is a joke. We believe she will be defeated. If she doesn’t, it is going to be a long year for Marion County Republicans. We’ve told you our predictions but we want to know what you think. Vote to let us know if you think Melina Kennedy will get the big win she needs on Primary Day and if Marion County Republicans can push their slate through despite ballot placement complications. We’ve been meaning to get this post up for the last few days but, sadly, we do actually have real jobs. We’re working on doing a full analysis on the implications of re-districting and will start with the Congressional Districts. The 1st Congressional District remains a safe Democrat seat for Pete Visclosky to sit in until he dies if he so chooses. He is unlikely to have any serious opposition in either the Primary or General Elections. In fact, its biggest impact is on the 2nd Congressional District. The 2nd Congressional District was molded as a district for Jackie Walorksi. The district has taken out the highly Democratic Michigan City and given it to the 1st District while Howard County and the Democrat area of Kokomo were drawn out completely. 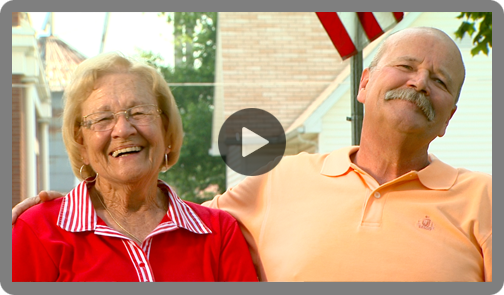 They also added some nice Republican spots in Elkhart and Kosciusko counties and all of Miami County. Will Jackie have a primary? We’re hearing yes but we highly doubt anyone is going to beat her. She is known as a tough campaigner and is putting together a campaign team that is already working with the Republican Congressional Campaign Committee. We strongly believe Congressman Donnelly was already focused on running for U.S. Senate in 2012 and this district makes that more likely. We’re not sure who the Democrats have warming up on the bench. The 3rd Congressional District, much like the 1st, has a bigger impact on the 2nd than on itself. Several key Republican areas were sliced out of the 3rd and given to the 2nd. Regardless, it looks to be a fairly safe Republican district provided Congressman Stutzman does not make any major mistakes. In the 4th Congressional District, we have a very nice Republican map. Unfortunately for Congressman Todd Rokita, it does not include his home. 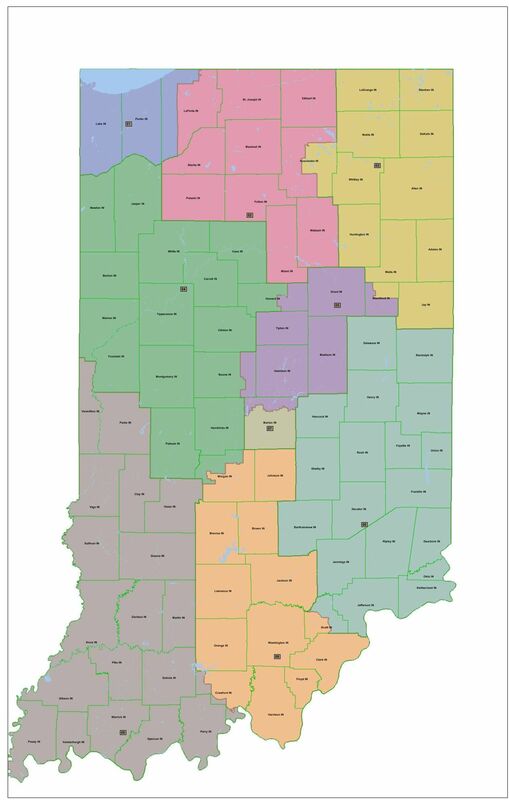 This is not an issue as we have heard for some time that Rokita planned to move to Hendricks County. It is a good thing since Rokita has about as many friends in the Legislature as we have in the Kennedy for Mayor HQ. The Congressman made a lot of enemies by putting out his own re-districting plan last year when he was Secretary of State. No better way to piss off the legislature than messing with the maps. Ironic that they used re-districting as a way to get back at him, huh? The 5th District is interesting but, as usual, it is due to Primary implications rather than General election races. Congressman Dan Burton has a good district for the General but not so much for the Primary. The northern portion of the old 5th is where Burton got his votes and it was put in the 3rd District. If you think his dustup with Messer was close in 2010, check out the numbers if this had been the district. The race would have come down to a few hundred votes rather than a few thousand. Burton was able to use his friends in the legislature to push Shelby County, Messer’s home county, out of the 5th. David McIntosh, however, is based in Madison County and that is in the 5th District. Will McIntosh take Burton out? God, we hope so because someone should. The 6th district looks to be fairly Republican but not so Republican that a poorly run race would be guaranteed victory. Congressman Mike Pence is all but declared to run for Governor. We expect he will announce sometime after the legislative session ends so he can start fundraising. Luke Messer is said to be taking a close look at the district and we expect he will run. McIntosh is said to be interested as well. While McIntosh is registered in Madison County, the new 6th has several of the counties he used to represent. We’re not all that enthused about a McIntosh return to Indiana…unless it is to finally rid our delegation of Dan Burton. There are a few other names being tossed around but none that should cause too much of an issue if Messer goes all in. The new 7th District is a bit of a mystery. Democrats say it is solidly Democrat while the Republicans seem to be split. We’ve heard some say it is a lock for the Democrats and some who are hopeful that the addition of the Republican Southside will make the district competitive. Either way, we think you’ll see a much more energized race there in 2012 than usual. Congressman Carson will crush any opponent in the Primary and the General could be interesting if the Republicans can get a legitimate candidate. Marvin Scott, this is not a request for you to throw your hat in. The likelihood of getting a strong Republican candidate could be impacted by the 2011 Mayor’s race. The 8th District lost some key Republican areas to the 4th and 9th Congressional districts and may well become the Bloody Eighth of the past. Congressman Bucshon should be safe in the Primary election. The General will really depend on who the Democrats can get to run. Democrats appear to be courting Brad Ellsworth for a curtain call but we don’t see it happening. He just got a great gig and he lost his home congressional district to Coats in his U.S. Senate bid. If John Gregg is the Democrat Governor candidate, it could make things interesting in the 8th (and 9th as well) but we still don’t think the Democrats have a candidate to beat Congressman Bucshon. Finally, the 9th District looks a bit better than it use to for Congressman Todd Young. Since this district has been tossed back and forth between the two parties like a hot potato, it is not surprising that Republicans decided to clean it up some. The district is more Republican than in the past and it looks much more favorable for Young to fend of Primary challengers. Many of the counties drawn out were won by his 2010 Primary opponents. The district does still include Jackson County where former Congressman Baron Hill resides. We would think Hill has had enough of fighting for this district for a decade but you never know. We would say the 9th is more Republican than before but by no means a lock. 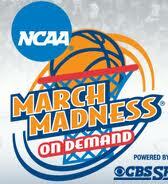 It is March Madness so let’s play in metaphorical terms. Coach Dan Parker looks down his bench for some substitution relief. His starters haven’t exactly been getting the job done. Bayh quit on the team before the clock ran out, and when fans thought Ellsworth would be an All-Star he busted like Greg Oden in the NBA. With the clock ticking Coach Parker has got to be worried. His roster lost in a blowout in 2010. Players like Baron Hill and Trent Van Haaften went down hard, along with every statewide candidate on the Democrat ticket. Options for the 2012 matches seem to be slim. We could see John Gregg or Joe Donnelly run in statewide races but if those are your two strongest contenders off the bench then you may be in for a long season. If Joe Donnelly decides to run for statewide office in 2012 Coach Parker now has to play tough defense in a congressional district they could barely hold in 2010. Who comes off the bench to go head-to-head versus someone like Jackie Walorski? No strong names come to mind. John Gregg may have been a giant in state politics, but that was nearly a decade ago. If he runs for Governor, he’ll most likely be battling the GOP team’s current MVP, Rep. Mike Pence. That isn’t exactly a fun matchup for Coach Parker. I’m sure Coach Parker and his team won’t back down from a tough game, then again about 39 players on their team currently have. When all is said and done, the vulnerability of the Democrat team in 2012 is very apparent. We could potentially see another massive blowout resulting in the pickup of a congressional seat, more gains in the General Assembly, and four more years of a GOP controlled executive branch. Coach Parker is scrambling to sub players in who can contend. Unfortunately, it’s hard to score when you’re always on defense. Word on Washington Street: Illinois State Legislature Looking to Tax Democrats in Exile? We’re hearing rumblings that some folks in the Illinois State Legislature are looking to start taxing some of the Democrat legislators who are holding up legislation from exile. The thought is that these legislators are conducting business from the state of Illinois and should have to pay some taxes on it. Just one more reason the House Democrats should come back to Indiana and get some work done. 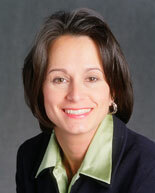 Melina Kennedy was endorsed by Emily’s List today. Click here to read the full release. Congratulations, Melina. You are the only woman in the race and, thus, their only choice.